How much can you earn renting your London property on Airbnb? 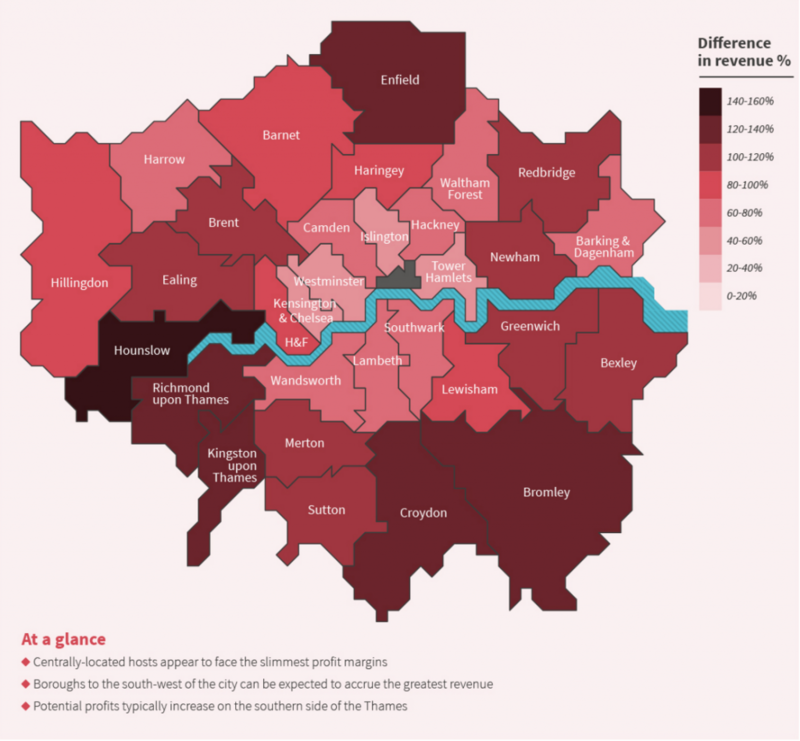 Looking at the study which was conducted by Towergate Insurance, it is evident that the inner city boroughs are the ones who actually see the least increase in profits when using websites such as Airbnb which is actually quite surprising. After all we know that most people who use Holiday-Let websites are tourists and the most in demand areas of London would presumably be the ones nearest the centre. 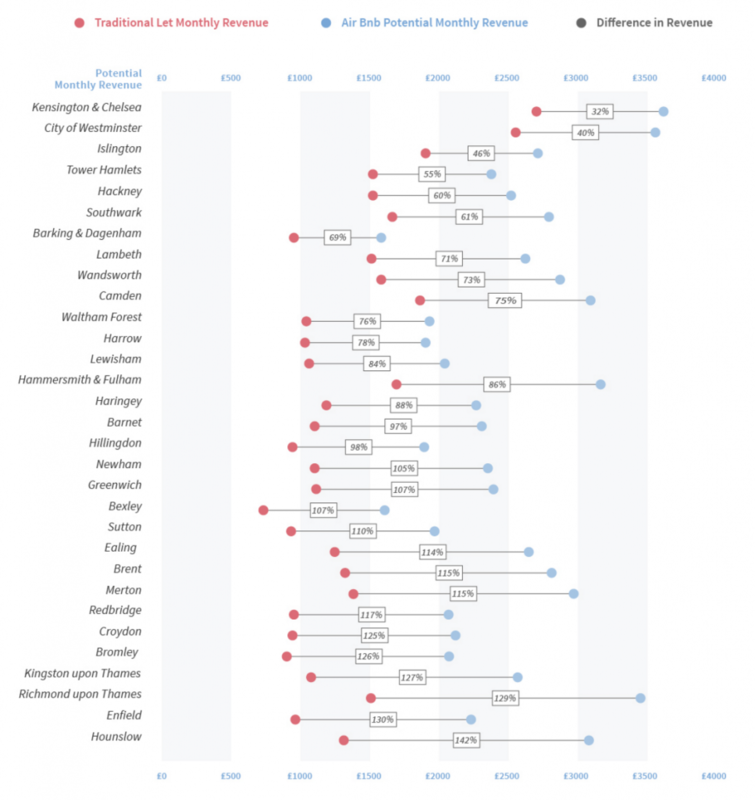 Kensington & Chelsea and Westminster remain the highest grossing areas when using short or Long Term Lets but there are some real gains in some boroughs when using Airbnb vs Traditional rental methods. The South West of London saw increases as high 142% with boroughs of Hounslow, Richmond upon Thames & Kingston Upon Thames doing particularly well. Boroughs with already high rental prices such as Islington, Hackney & Camden didn’t fare quite so well but still saw increases of up to 75%.All this points to the fact that renting on Airbnb is a great way to boost earnings on your rental property but it isn’t always that simple. 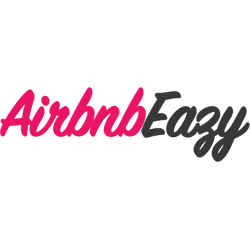 One factor which isn’t taken into account on this study however is occupancy rate which is really the lynchpin of any successful Airbnb rental and that is where central locations prosper. A 142% increase is all well and good but if you’re occupancy rates are 25% you’re better off putting your home on a long-term let with an Estate Agent. We pride ourselves on our great occupancy rates and currently only take on properties inside zones 1 & 2 which are generally the most in demand ares of London. Airbnb vs Long-Term Rental. Which is best? Airbnb in London – What’s the future? Could London be about to crack down on Airbnb?